" WHAT COMES TO MIND WHEN I SAY the words black male and black female?" This is the question Shantelle Browning-Morgan, OCT, asks her Grade 11 Walkerville CI students at the start of each African Studies course. Common answers include guns, violence, rap, hip hop, baby daddy, loud, welfare queen. And, as Browning-Morgan expects, many use the N-word. It may be hard to hear, but it's the perfect way to begin a course that students later describe as life changing. As a 2011 winner of the Governor General's History Award for Excellence in Teaching, Browning-Morgan would likely agree on the life-changing nature of this locally developed course. She piloted what is officially known as the History of Africa and Peoples of African Descent — at the Windsor school — after being inspired by a similar Toronto DSB course. Dave Watkins, OCT, a 2007 Governor General's award recipient and Windsor native, was part of the Toronto team at Weston CI that developed the pivotal African Studies course. Now, 10 years later, more than 20 Toronto DSB schools run this program. With this kind of progress, you wouldn't think that Watkins would take notice of Browning-Morgan's efforts — but that isn't the case. "No one is more deserving of this Governor General's award than Shantelle," says Watkins. "She was a pioneering warrior to bring African Studies to Windsor. This course is not just good for black kids, it's good for everyone." Browning-Morgan grew up living an unhealthy contradiction. She heard her father's stories about their rich African heritage but did not learn about it in school. She struggled with her identity during her teens, feeling discomfort in her own skin. That changed when she joined the Essex County Black Historical Research Society at the University of Windsor..
"When I think about what my African ancestors endured, I ought not to be here," says Browning-Morgan. 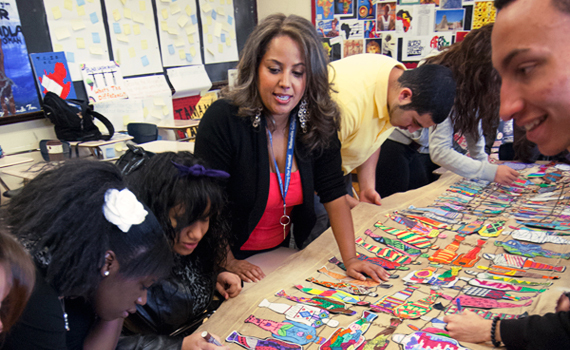 "It's my responsibility, my purpose, to share their stories with children of all origins. As relatives in the human family, we all benefit when we learn about one another. It's the best way to fight racism." Browning-Morgan's course is a cultural and social examination of history, focusing on more than just battles and political leaders. In fact, it begins by exploring how popular culture and the media reinforce stereotypes — sensationalizing violence, irresponsibility and misogyny. Browning-Morgan explains how these harmful messages can discourage black teenagers from pursuing an education, a career and other life goals. Students are astonished and intrigued by what they learn, especially when they analyze mainstream hip-hop lyrics — much of which Browning-Morgan calls degrading and socially unconscious — and look at the coded language of spirituals. They even compare hip hop to minstrel-show music later in the semester. 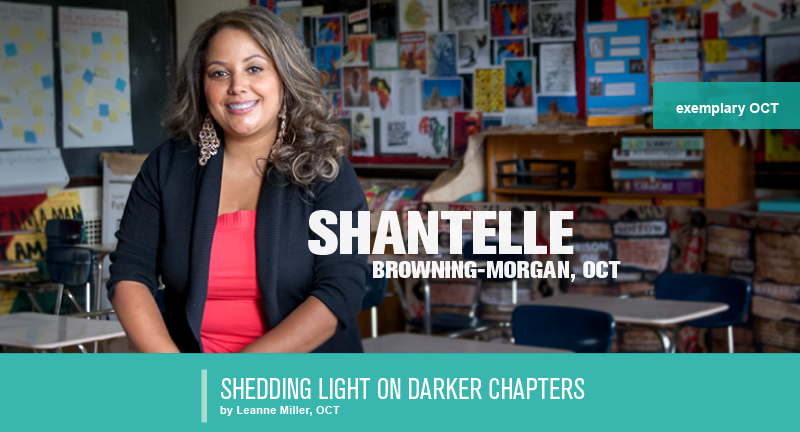 Shantelle Browning-Morgan, OCT, and her Grade 11 students work on a transatlantic slave-trade activity to better grasp the horrors that Africans experienced during the middle passage. Empowered by their newfound knowledge, last year's impassioned students initiated a school-wide campaign to end the use of the N-word. They put up posters, developed petitions and distributed information cards. "Everyone should know how bad that word is," Petra notes in her course feedback. Shanice writes: "Now my two goals are to stop using the N-word and start educating my friends about why they shouldn't use it." To accomplish this second goal, Shanice and her classmates must first travel back several thousand years to understand what exactly happened. "If they're surprised to discover that Africa is not a country," says Browning-Morgan with a laugh, "they're shocked to discover that black societies were the cradle of humankind and that Egyptians don't have white skin." The course moves from early civilizations to the transatlantic slave trade. The topic of slavery tends to be upsetting for the students, but it ultimately uplifts them when they understand the miracle of anyone having survived its brutality. They quickly realize how strong the survivors must have been and how important freedom was to them. Other units include African imperialism, the scramble for colonies, North American oppression and civil rights. "The Underground Railroad is a wonderful example of cultures working together for a common goal," says Browning-Morgan. "First Nations, black and white men and women in the United States and Canada accomplished something miraculous. Kids need to see that the best things happen when everyone works together." The focus returns to Africa as students learn about the fight for independence — culminating in South Africa — and explore more recent issues like the Rwandan genocide, the Darfur crisis, blood diamonds, poverty, hunger and HIV/AIDS. Then students revisit Canada and learn about black people's involvement in both world wars and the story of Nova Scotia's Africville. Students come out of the course with a strong understanding of slavery and colonialism. Guided by Browning-Morgan, the learning extends beyond the classroom. Inspired by West African tradition, students create masks that reflect their heritage and incorporate Ghana's adinkra symbols. The colourful ancestral masks are on display and show Croatian, Ghanaian, American, Lebanese, Honduran, First Nations, European-Canadian and African-Canadian ancestry. As well, many students participate in Walkerville's Black Cultural Showcase. They sing, dance, compose poetry, do dramatic readings and play African drums during several sold-out shows. Students also attend the University of Windsor's African Diaspora Youth Conference along with several hundred students from Toronto, Windsor and Detroit. They discuss their common heritage and their life and career aspirations, and they visit venues like the Underground Railroad Museum. Back in Browning-Morgan's class, students discover Canadian trailblazers, including Mary Ann Shadd, Abraham Doras Shadd, the No. 2 Construction Battalion, Viola Desmond, Josiah Henson and more recent heroes like Rosemary Brown, Lincoln Alexander and Michaëlle Jean, as well as Oscar Peterson and K'naan. "They come to see that black heroes are more than athletes or rappers," Browning-Morgan explains. Browning-Morgan pays as much attention to how she delivers her curriculum as to what is in it. When she starts the slavery unit she wants students to experience the tedium of picking cotton all day. She gives them balls of red yarn and instructs them to stand still, look forward and stay silent. Then she tells them to tie knots in their yarn over and over. Last semester's students lasted 19 minutes before they quit in anger — one student even stormed out. Then their teacher quietly explained her rationale. "Enslaved people were forced to labour for over 400 years at far more difficult tasks, in much harsher conditions. And you can't tie knots for 20 minutes?" The teenagers were humbled. As relatives in the human family, we all benefit when we learn about one another. It's the best way to fight racism. "If she'd just told us about it or we'd read about it, it wouldn't have had the same impact," says Shai. "We'll always remember tying knots in red yarn representing blood." Alyssa asked Browning-Morgan to hang her knotted yarn at the front of the classroom as a reminder for everyone — and it's still there. Browning-Morgan wants to humanize the 30 million Africans stolen from their homes. "We must refer to them as enslaved people, not slaves," she says. One way that Browning-Morgan achieves this is through a transatlantic slave-trade activity. Students pick five names from the African Names Database and design cut-out representations that reflect each person's culture. After giving their cut-outs names and birthplaces, the students use small chains to attach them to a symbolic slave ship that hangs in the classroom. "My rationale is to return their names, birthplaces, cultures and humanity," Browning-Morgan explains. "While the cut-outs are beautiful, the activity doesn't diminish the horrors that Africans experienced during the middle passage. It helps restore beauty to people who have been stripped of humanity for far too long. "?And just like that, Browning-Morgan's gift of knowledge and empowerment reaches further than any of us could expect. "I've never felt this happy before," Petra writes in her course feedback. "I feel beautiful in my skin for the first time. I have a rich history and I'm going to teach this course one day. Thank you for making me feel important. I didn't want to take this course because of my own shame, but it was the best choice I ever made." Use pictures and graphics to bring people and places to life. PowerPoint helps reinforce lectures and supplement textbooks and handouts. Have students write about what they've learned. Ask them to think about how the historical developments discussed in class affected their ancestors and have ultimately changed their lives today. Write back to students without penalizing spelling or grammar mistakes — but do correct them. Sit in a circle for class discussions. Have a hot topic to explore? Get students to face each other so they can hear everyone. Ask them to listen carefully, keep an open mind and speak respectfully and purposefully. Give assignment options. Essays, presentations, slideshows and poetry are a few formats students can choose from to showcase their strengths and explore new mediums of communication.